, the celebrated apologist for the Quakers, and one of the ablest writers of that sect, was born at Gordonstown, in the shire of Murray, Scotland, in 1648, of an ancient and very honourable family. 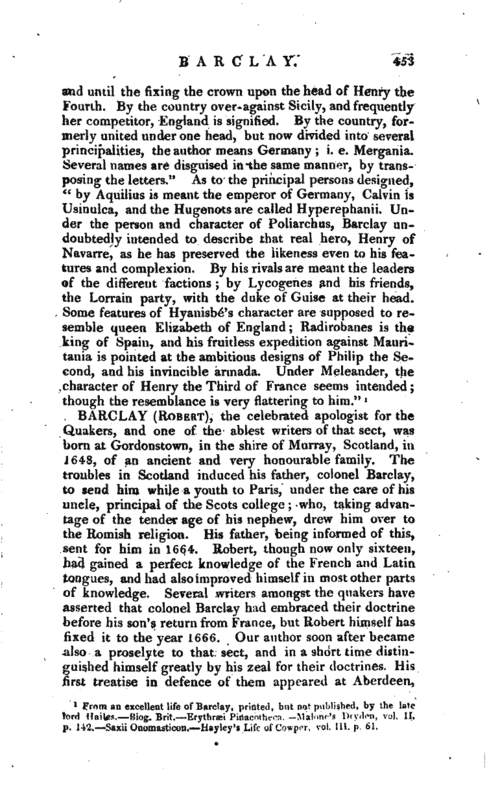 The troubles in Scotland induced his father, colonel Barclay, to send him while a youth to Paris, under the care of his uncle, principal of the Scots college who, taking advantage of the tender age of his nephew, drew him over to the Romish religion. His father, being informed of this, sent for him in 1664. Robert, though now only sixteen, had gained a perfect knowledge of the French and Latin tongues, and had also improved himself in most other parts of knowle_dge. Several writers amongst the quakers have asserted that colonel Barclay had embraced their doctrine before his son’s return from France, but Robert himself has tixed it to the year 1666. Our author soon after became also a proselyte to that sect, and in a short time distinguished himself greatly by his zeal for their doctrines. His rirst treatise in defence of them appeared at Aberdeen, | 1670. It was written in so sensible a manner, that it greatly raised the credit of the quakers. 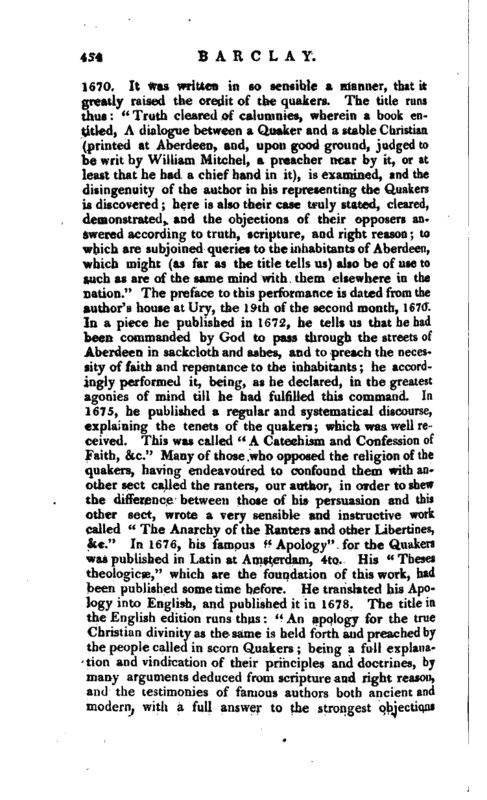 The title runs thus “Truth cleared of calumnies, ‘wherein a hook entitled, A dialogue between a Quaker and a stable Christian (printed at Aberdeen, and, upon good ground, judged to be writ by William Mitchel, a preacher near by it, or at least that he had a chief hand in it), is examined, and the disingenuity of the author in his representing the Quakers is discovered here is also their case truly stated, cleared, demonstrated, and the objections of their opposers answered according to truth, scripture, and right reason to which are subjoined queries to the inhabitants of Aberdeen, which might (as far as the title tells us) also be of use to such as are of the same mind with them elsewhere in the nation.” The preface to this performance is dated from the author’s house at Ury, the 19th of the second month, 1670. In a piece he published in 1672, he tells us that he had been commanded by God to pass through the streets of Aberdeen in sackcloth and ashes, and to preach the necessity of faith and repentance to the inhabitants he accordingly performed it, being, as he declared, in the greatest agonies of mind till he had fulfilled this command. In 1675, he published a regular and systematical discourse, explaining the tenets of the quakers; which was well received. 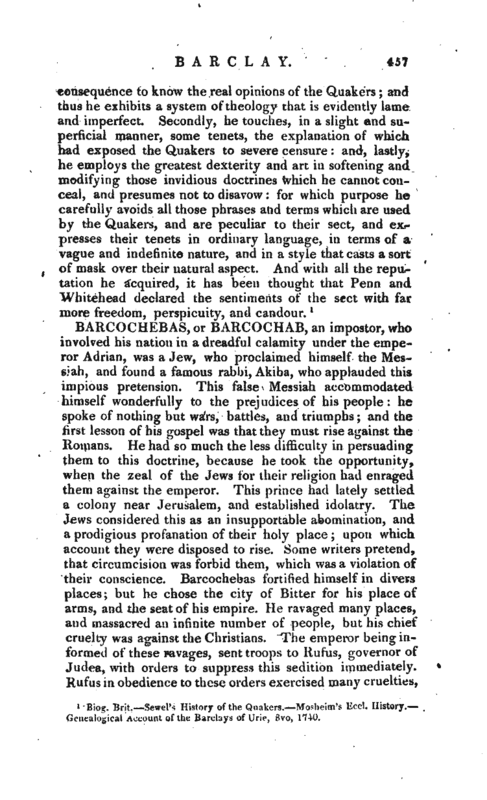 This was called “A Catechism and Confession of Faith, &c.” Many of those who opposed the religion of the quakers, having endeavoured to confound them with another sect called the ranters, our author, in order to shewr the difference between those pi his persuasion and this other sect, wrote a very sensible and instructive work called “The Anarchy of the Ranters and other Libertines, &e.” In 1676, his famous < e Apology“for the Quakers was published in Latin at Amsterdam, 4to. His” Theses theologies,“which are the foundation of this work, had been published some time before. He translated his Apology into English, and published it in 1678. 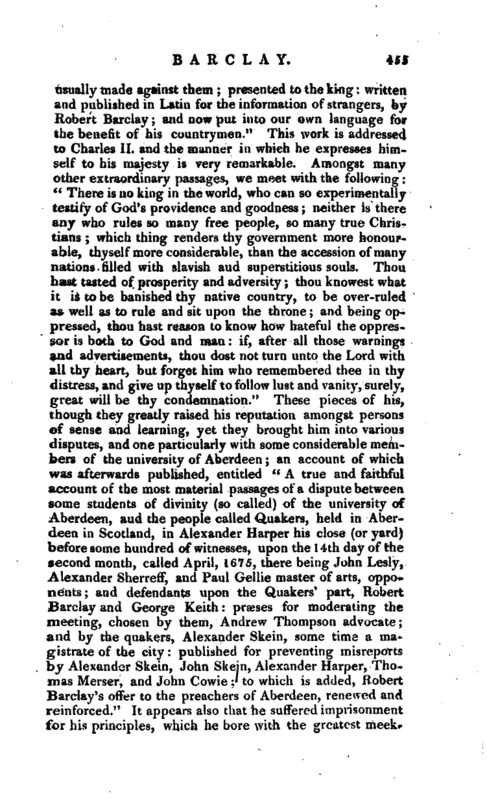 The title in the English edition runs thus” An apology for the true Christian divinity as the same is held forth and preached by the people called in scorn Quakers being a full explanation and vindication of their principles and doctrines, by many arguments deduced from scripture and right reason, and the testimonies of famous authors both ancient and modern, with a full answer to the strongest objections | usually made against them presented to the king: written and published in Latin for the information of strangers, by Robert Barclay; and now put into our own language for the benefit of his countrymen.“This work is addressed to Charles II. and the manner in which he expresses himself to his majesty is very remarkable. Amongst many other extraordinary passages, we meet with the following:” There is no king in the world, who can so experimentally testify of God’s providence and goodness; neither is there any who rules so many free people, so many true Christians which thing renders thy government more honourable, thyself more considerable, than the accession of many nations rilled with slavish aud superstitious souls. Thou hast tasted of prosperity and adversity thou knowest what it is to be banished thy native country, to be over-ruled as well as to rule and sit upon the throne and being oppressed, thou hast reason to know how hateful the oppressor is both to God and man if, after all those warnings and advertisements, thou dost not turn unto the Lord with all thy heart, but forget him who remembered thee in thy distress, and give up thyself to follow lust and vanity, surely, great will be thy condemnation.“These pieces of his, though they greatly raised his reputation amongst persons of sense and learning, yet they brought him into various disputes, and one particularly with some considerable members of the university of Aberdeen an account of which was afterwards published, entitled” A true and faithful account of the most material passages of a dispute between some students- of divinity (so called) of the university of Aberdeen, aud the people called Quakers, held in Aberdeen in Scotland, in Alexander Harper his close (or yard) before some hundred of witnesses, upon the 14th day of the second month, called April, 1675, there being John Lesly, Alexander Sherreff, and Paul Gellie master of arts, opponents and defendants upon the Quakers’ part, Robert Barclay and George Keith praeses for moderating the meeting, chosen by them, Andrew Thompson advocate; and by the quakers, Alexander Skein, some time a magistrate of the city published for preventing misreports by Alexander Skein, John Skein, Alexander Harper, Thomas Merser, and John Cowie to which is added, Robert Barclay’s offer to the preachers of Aberdeen, renewed and reinforced.“It appears also that he suffered imprisonment for his principles, which he bore with the greatest | meekness. In 1677, he wrote a large treatise on” universal love.“Nor were his talents entirely confined to this abstracted kind of writing, as appears from his letter to the public ministers of Nimeguen. In 1679, a treatise of his was published in answer to John Brown he wrote also the same year a vindication of his Anarchy of the Ranters. His last tract was published in 1686, and entitled” The possibility and necessity of the inward and immediate Revelation of the Spirit of God towards the foundation and ground of true faith, proved in a letter written in Latin to a person of quality in Holland, and now also put into English.’ 7 He did great service to his sect by his writings over all. Europe. He travelled also with the famous IVlr. Penn through the greatest part of England, Holland, and Germany, and was every where received with great respect. When he returned to his native country, he spent the remainder of his life in a quiet and retired manner. He died at his own house at Ury, on the 3d of October 1690, in the forty-second year of his age, leaving seven children, all of whom were alive in October 1740, fifty years after their father’s death, and the last survivor, Mr. David Barclay, a merchant of London, died in March 1769, in his eighty-eighth year, a gentleman still remembered for having had the singular honour of receiving at his house in Cheapside, three successive kings, George I. II. and III. when at their accession they favoured the city with their presence. From his windows they witnessed the procession, previous to dining with the lord-mayor and citizens at Guildhall on the lord-mayor’s day. 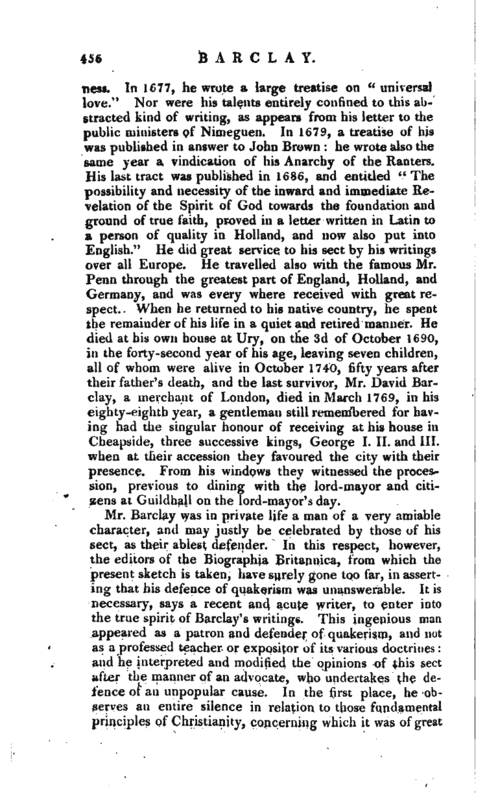 1 Biog. Urit. Scwel’s History of the Qcalcers. Mohsim’s Eccl. History. Genealogical Account of the Barclays of Urie, 8vo, 1740.